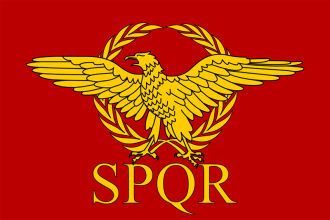 Historically, the Roman Empire was the dominant power in Europe in the first few centuries AD. While the Western Roman Empire ceased to exist long before the era covered by Europa Universalis IV, the Eastern Roman Empire continued to survive as Byzantium. Any Christian or Pagan nation other than the Holy Roman Empire or the Papal State can restore the Roman Empire by decision after re-conquering most of the historical Empire. The other way to play the Roman Empire is to restore the Roman Empire as Byzantium in Crusader Kings II and converting the save to EU4 using the Europa Universalis 4 Save Converter. Not since the Romans in the second century has one empire commanded the entirety of the Mediterranean and beyond. If we claim this land, we can scoff at whatever pretenders may claim in Constantinople or the Holy Roman Empire and proclaim ourselves the true successors of Rome. The Roman Empire does not exist. is not a custom nation. owns all provinces of the regions of Italy, France, Iberia, Balkans, Anatolia and Mashriq. Fez (343), Tunis (341), Cairo (361), London (236), Yorkshire (245), Zeeland (96) and Wien (134). primary culture become Roman culture. changes its primary culture to Roman. gets a core on Roma (118). All your owned provinces will cease to be part of the Holy Roman Empire. The country removes all its provinces from the Holy Roman Empire. 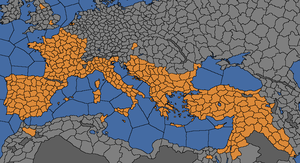 Restore the Roman Empire and own the entire Mediterranean and Black Sea coast lines.